Wheel bearing for rear wheel of front wheel drive (FWD) cars nowadays are using wheel hub bearing. This type of bearing has tire hub attached. This bearing is also referred to as wheel hub assembly (WHA), hub assembly, wheel hub unit, wheel bearing hub, sometimes shortened as hub assy. If it has been used for a long time then the wheel bearing will make a humming sound, sometimes even a rumbling sound, it can be heard clearly at high speed. Also read the bearing sound test. To remove this car wheel bearing is quite easy with just common tools such as: car jack, wheel wrench, slot head screwdriver, small crowbar, hammer, 12 mm open end or ring spanner or socket 12 mm, 30 mm socket wrench, and hardened nail. The 30 mm socket wrench is used to turn the spindle nut. A socket with 3/4 inch handle is better. Prepare also extension pipe for socket handle, because possibility that the spindle nut is stuck when it will be loosened. If using a socket with a 1/2 inch handle, the handle can be broken if the nut is stuck. CAUTION: hand brake is not activated during repair, in order to remove the brake drum. 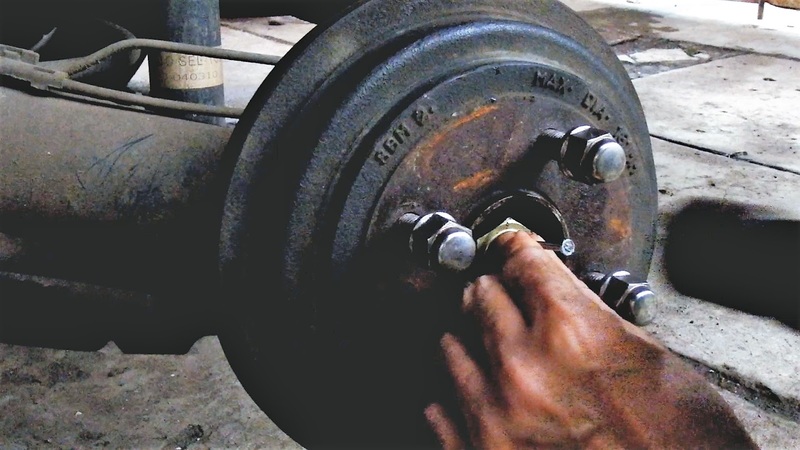 Apply wheel chocks to other wheels to ensure the vehicle does not move, before jacking up and releasing the wheel. 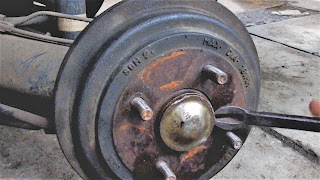 Once jacked up, the car body should be supported by a jack stand to ensure stability, or support the car body with spare tire and wooden beams. 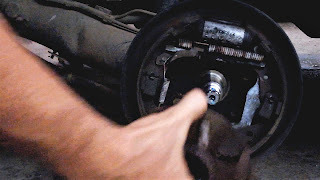 Steps of removing wheel hub bearing can be seen on the following YouTube video. As the photo above, remove the nut cap by using a slot screwdriver, can also be done by a small crowbar. Undo notch on the nut by using hardened nail. The nail is struck by a hammer. If using center punch instead of nail, make sure the center punch end is sharp. 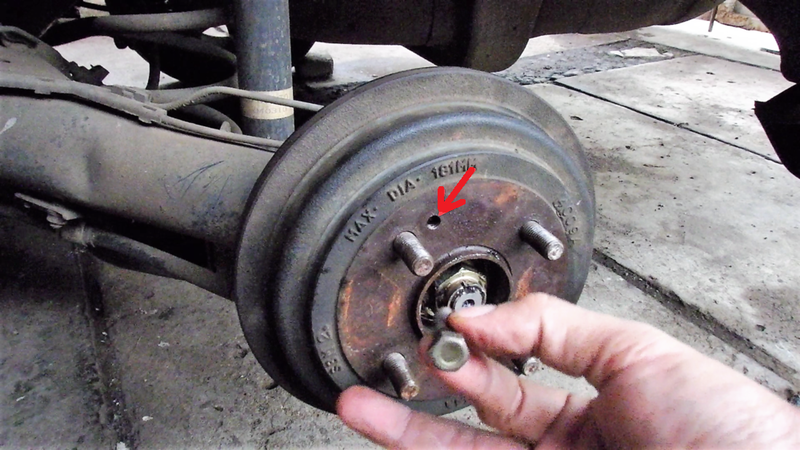 Put back wheel lug nuts to wheel stud bolts before hammering, as a precaution to protect wheel stud bolts if the hammer is misdirected. If the wheel stud bolts are hit and bent, it will be difficult to remove the brake drum. If the wheel stud bolt thread is damaged by the hammer, then the work can not be postponed because the wheel can not be re-installed. In the photo above it appears the notch on the spindle nut has been undone, it is pointed by a red arrow. 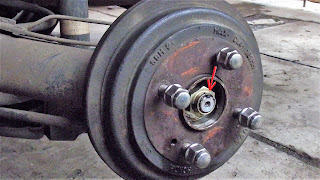 Using a bolt, brake drum is pushed out from the hub to release it. For this car, bolt is a 12 mm bolt or M8 thread. Seen in the photo above the bolt hole is designated with a red arrow. When the 12 mm bolt is turned clockwise, the bolt will enter and the brake drum will be pushed out and released from wheel hub. Note that all wheel nuts are removed when 12 mm bolt is turned. If the brake drum is stuck, hit the drum with a hammer to tear down rust and dirt that makes drum jammed. 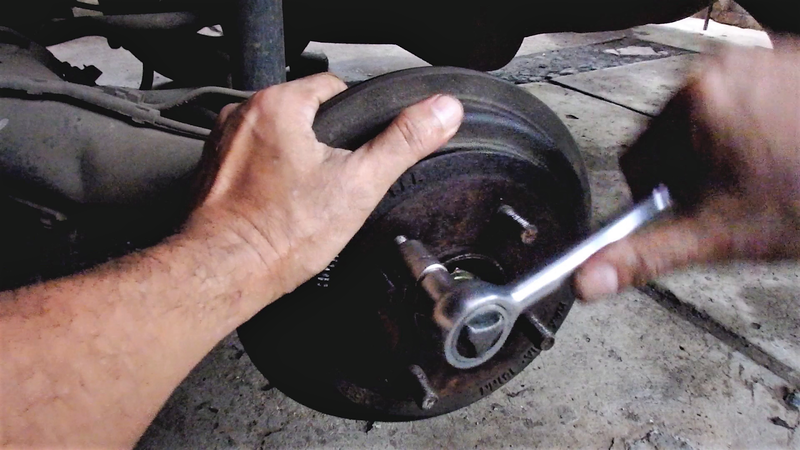 Use the socket wrench with 3/4 inches handle to loosen the spindle nut. In this case, it is using 30 mm socket size. If the nut is stuck, use an extension pipe to lengthen the handle to get the leverage effect. The example above is for the left rear wheel of Honda City 2004. 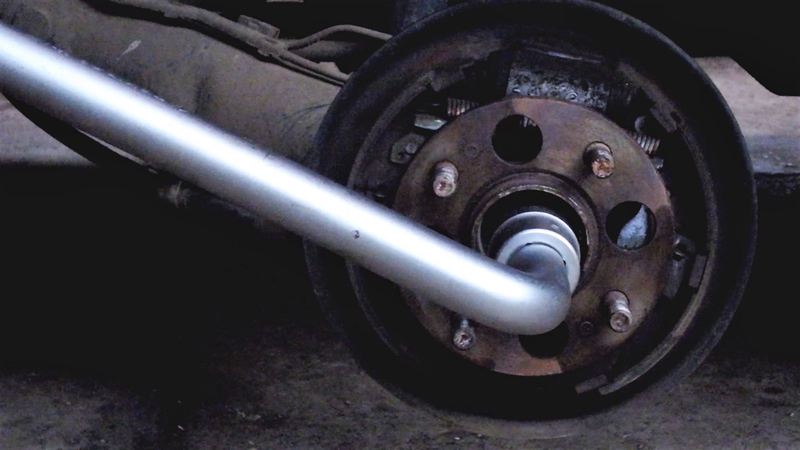 But with a little adjustment can also be applied to other cars that use wheel hub bearing.